The aim of our work is the optical detection of electron paramagnetic resonance (ODEPR) of metalloproteins with coherent Raman scattering (compare right hand figure). 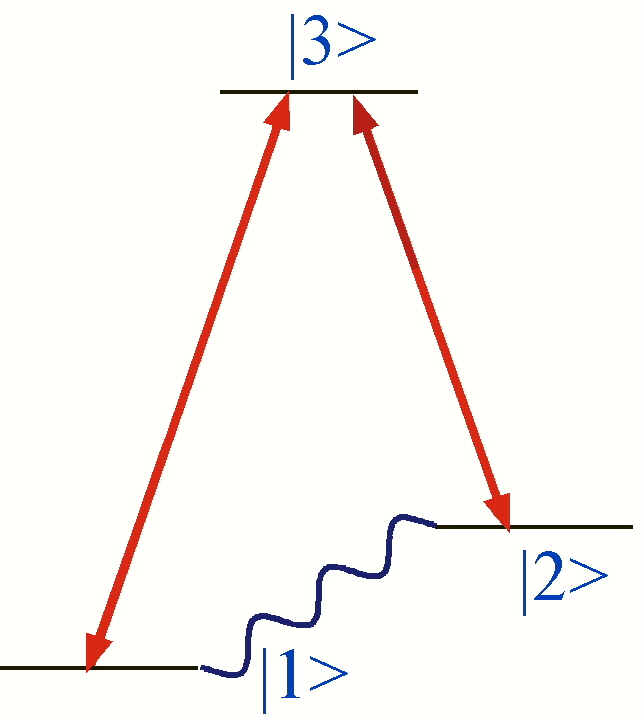 In this experiment a coherent superposition of two states |1> and |2> of the electron spin is created with a microwave field, here depicted as the wavy line. A laser beam, which is resonant with the optical transition |1> - |3> interacts with the sample. The two fields excite a polarisation in the second optical transition, between the states |3> and |2>, which becomes the source of a third wave. This frequency of the Raman field is shifted compared to the incident laser beam. An interference between the Raman and laser field produces a beat signal at the microwave frequency. Optically detected EPR by coherent Raman scattering provides information about the electronic structure of metalloproteins which cannot be obtained with other methods. Contributions from impurities to the EPR spectrum can be eliminated by choosing an appropriate optical wavelength, thus leading to a simplification of the spectra. 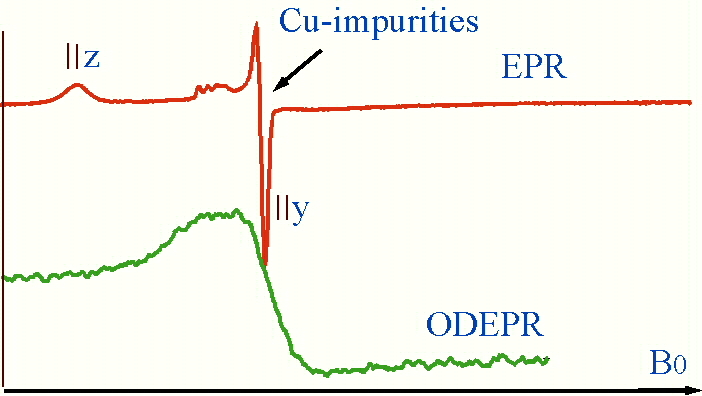 This could be demonstrated for the haem protein cytochrome c, where the conventional EPR signal shows impurities of copper (see upper trace of the following figure). The ODEPR signal (lower trace) arises solely from haem molecules, thus demonstrating the chemical selectivity of the method. The combined excitation with microwave and laser radiation allows the investigation of the relative orientations of magnetic and electronic axes. This aspect is particularly important if the proteins are not crystallized, i.e. the molecules are statistically oriented. We focused our work onto the investigation of different optical bands, which may possess different optical polarisations and therefore determine the ODEPR-lineshape in a characteristic way. For azurin we could demonstrate that our method is able to elucidate the symmetry imposed by the surrounding ligands onto the metal center and thus can make significant contributions to the investigation of the electronic structure of the protein's active site. This is shown in the right hand figure: while the upper trace shows the isotropic, conventional azurin EPR-spectrum, the three following spectra are ODEPR spectra of azurin detected at different wavelenghts. Simulation of these lineshapes revealed the different optical anisotropies for the ligand-field and charge-transfer region. 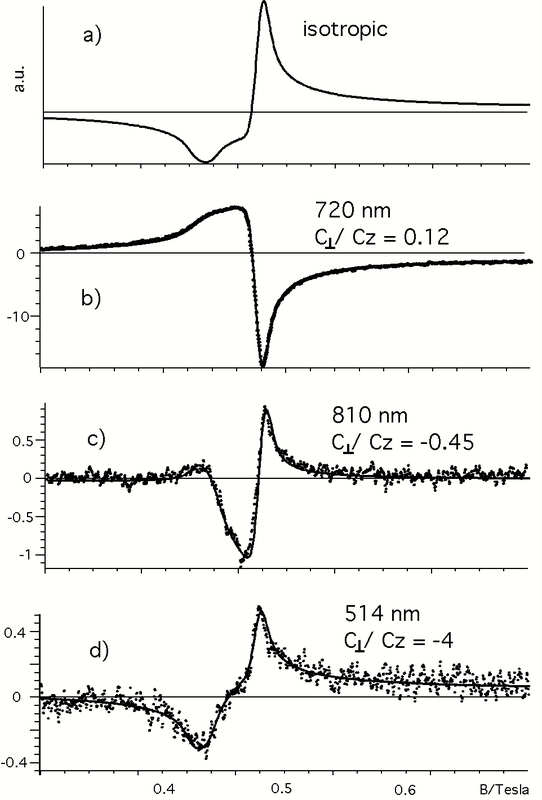 The "C-parameters" are used as a measure for the optical anisotropy along specific molecular axes. So far we have investigated four different protein species with different magnetic and optical properties: the blue copper protein azurin, the hemeprotein cytochrome c551, and two Iron-Sulfur-Cluster (Rubredoxin and 7Fe-Ferredoxin). We are confident that several other protein species can be investigated with our method, for example molecules containing two metal centers, where we will try to distinguish between the two centers through their optical properties. In addition, we study single crystals containing transition metal ions. In particular ruby, whose electronic structure is well known, is an excellent test bed for the validation of the theory of coherent Raman scattering. The ruby ground state and the R-lines are depicted in the following figure. An ODEPR spectrum of ruby is also given, where the optical and magnetic resonances are indicated with vertical lines. More information about ODEPR on ruby can be found here. Up to now all our experiments were done at a microwave frequency of 14 GHz. We are now in the process of building another spectrometer operating at 35 GHz. The higher frequency should offer higher sensitivity and greater spectral resolution. This will be particularly useful for molecules with small g-anisotropy. Major result: Measurement of tensor orientation. Optical detection of transition metal ion electron paramagnetic resonance by coherent Raman spectroscopy (Chem. Phys. Lett. 266, 543-547 (1997)). Magnetic and optical anisotropy of Clostridium pasteurianum rubredoxin from optically detected electron paramagnetic resonance (J. Chem. Phys. 115, 9821-9826 (2001)).